This particular set focuses on aircraft exhaust stains. 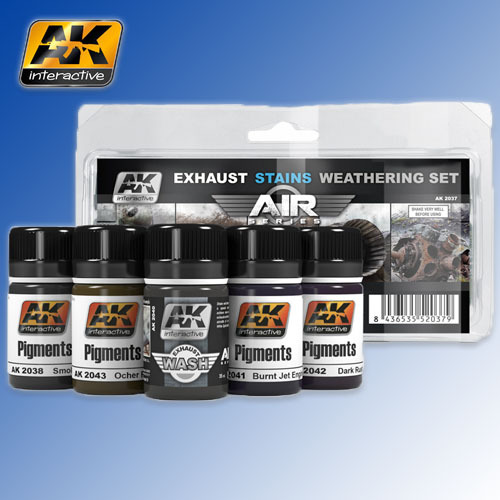 In this set there are 4 pigments and one wash: AK2038 Smoke, AK2040 Exhaust Wash, AK2041 Burnt Jet Engine, AK2042 Dark Rust, and AK2043 Ochre Rust. With this products the modeller can achieve many different finishings for the exhausts of all airplanes in all eras. This is a prone area for rust and dirt accumulation and the pigments are perfect to achieve this textures.